With Master’s guidance, this class intends to teach the children the skills and techniques of traditional martial arts. The program is designed to make the children benefit of the teachings of discipline, behavior, confidence, respect, courtesy along with self-defense, self-control and concentration. Additionally for achieving their long-term goal, children will be having fun throughout combining fitness games. They will also be learning how to physically and mentally train themselves, while through practice and repeat of Taekwondo forms and techniques, children will be learning how to improve their coordination between the left and right side of the brain. By helping with their eye-hand, eye-foot coordination, the children will also be improving their academic achievements. For more information and enroll details please contact us! In martial arts one continues to grow physically and spiritually on and on. After your child has learned the basic and the more evolved classes of the martial arts, it is time for him to learn how to build the most important aspects of life. Teach him how to become a more balanced person, how to coordinate his actions to the best of possibilities, to focus better as well as how control and discipline himself while being aware of the general safety procedures, how he learns to work in a team and respect his comrades along with higher authority figures. Teenagers will be improving their academic achievements with this Taekwondo class. The class completes their physical and mental strength, along developing self-discipline, improving confidence and reducing stress. Likewise, together with their peers, they will be learning good communication skills. Watch how your child become the respectful adult figure of tomorrow. This class aims to encourage the socialization skills of children under 4 as well as their self-control capabilities. Focusing on the development of mastering both gross and fine motor skills, achieving different levels of accomplishments for a successful academic career, the children learn to develop good listening and concentration skills. Taekwondo will help your children develop better physical strength and balance, confidence, concentration, memory, coordination between eye-foot and eye-hand. It will also develop their self-defense skills, listening ones along with concentration and memory. Be your child role model through martial arts! Teach your child through example how to have the self-discipline and self-confidence to keep it all together, as well as how to build his own self-defense and grow not only physically but spiritually as well. You don’t need any experience as you’ll start at the beginning and you’ll get on track with the help of our professional instructors. 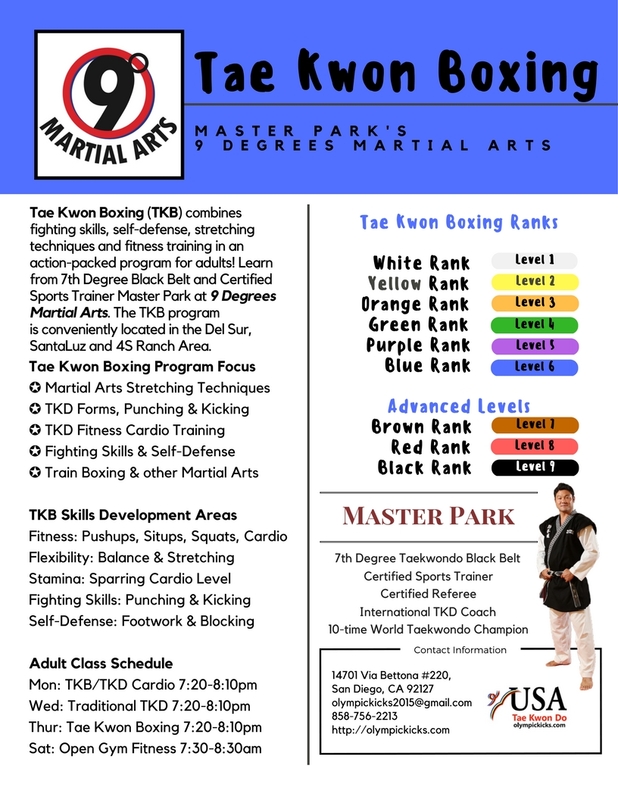 Adult classes of Taekwondo focuses on strength, control, losing weight and shaping their bodies. They will also be learning how to be more confident along with how to release stress from their lives. Family lessons offer the opportunity to all family members to spend some great and productive time together while learning something new and exciting. All members of the family will build a stronger bond by learning principles such as respect, humility, perseverance, self-control and honesty. All these ingredients will help you and your children come together as stronger and more united than ever. We encourage multiple family members to enroll with your child to get a special discount! Your child is becoming more delighted with martial arts and wants to learn even more? If he’s specially dedicated, then he has the opportunity to receive the special attention he deserves within the Black Belt Club. He will be receiving concentrated lessons and special attention from our masters in order to become tomorrow’s Black Belt specialist. The Black Belt Club is composed of selected elite students who are committed towards becoming a black belt graduate in the future. In and out of school, the students will be exhibiting the qualities of Black Belt Excellence in terms of courtesy and understanding the discipline. Besides the great fun way for your child to work on his reaction skills that will prepare him for the ring, sparring will also prepare your child for real-life defense situations. In order to succeed, self-defense likewise sparring requires a great amount of conditioning and practice. It is well known that practicing one helps as well with the other, and while some would tend to consider sparring too risky for their children, it is nothing but a way to teach your child how to deal with things such adrenaline rush and indecision when met with real life situations where he’ll be attacked. Let your child learn how to not let himself be intimidated and be capable in real life self-defense by learning all the risky tricks in a safe environment! Does your child require extra advanced training or help with his basic techniques, focus or concentration? No need to worry! Our team of master specialists will customize a special one-on-one program for your child and offer him the training he needs in order to better grasp the concepts of the martial-arts. Private lessons are available to all age categories upon schedule. Depending on each person’s possibilities, the schedule for private lessons is flexible to the customers’ convenience.